Everyone deserves to have confidence in their body and overall appearance. If you have decided plastic surgery is the right way for you to achieve the appearance you want, Park Meadows Cosmetic Surgery offers financing options to help you access our services. You can apply for a variety of financing plans through CareCredit using the online credit application. During your consultation, we can discuss the details of your financing options. Patient Financing Simplified. Now, a better way to pay for the care that patients really want or need. Your best you is closer than you think - look, feel and be your best with Alphaeon Credit! Apply Now! The Latitude card from Keybank gives you the flexiblity to pay for the things that just can't wait, while managing your balance over a timeframe that fits your budget. Check out the Lone Tree branch at 303-262-8090 to learn more about this card! CosmetAssure® is the GOLD STANDARD in complications insurance. It is an affordable solution for patients who choose to have elective cosmetic surgery to avoid the financial burden of unexpected post-surgery complications. 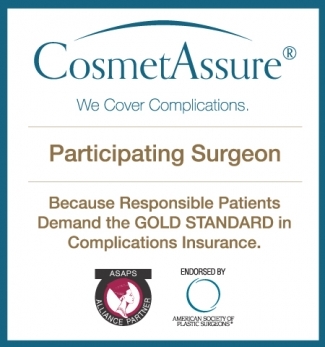 CosmetAssure® is endorsed by the American Society of Plastic Surgeons (ASPS) and covers the cost of caring for complications within the first 45 days after cosmetic surgery. All women who have had a mastectomy are required by federal law to be provided breast reconstruction. These rights are provided within the Women’s Health and Cancer Rights Act of 1998 (WHCRA). This federal law insists that group health plans and individual health policies that provide coverage for mastectomies also provide coverage for breast reconstruction in connection with such mastectomy. Under WHCRA, group health plans, insurance companies and health maintenance organizations (HMOs) offering mastectomy coverage also must provide coverage for certain services relating to the mastectomy in a manner determined in consultation with your attending physician and you. This required coverage includes all stages of reconstruction of the breast on which the mastectomy was performed, as well as surgery and reconstruction of the other breast to produce a symmetrical appearance. The staff at Park Meadows Cosmetic Surgery is experienced in working with insurance companies in regards to breast reconstruction; however, we understand that each insurance company is unique. Prior to your consultation, we will verify your benefits to ensure that your plan allows for you to see us. Please call our office at (720) 457-4471 for additional information regarding reconstruction and your insurance.